Over the past couple of days, thousands of bands have been filing into Austin for the SXSW music festival so it’s about time I write my annual who’s playing Japan Nite this year post. Kao=S, Charan-po-rantan, Jake stone garage, Chihiro Yamazaki + Route 14 Band, Pirates Canoe, FOUR MINUTES TIL MIDNIGHT and JOSY will all playing at the regular Japan Nite show on Friday. On Thursday afternoon, they will be joined by LITE, The Mornings, SuiseiNoboAz and Teen Runnings at the free Japan Preview Show. Crossfaith, Peelander-Z, Shugo Tokumaru, The Suzan, and I’m sure more I’m forgetting will also be playing at SXSW this week. 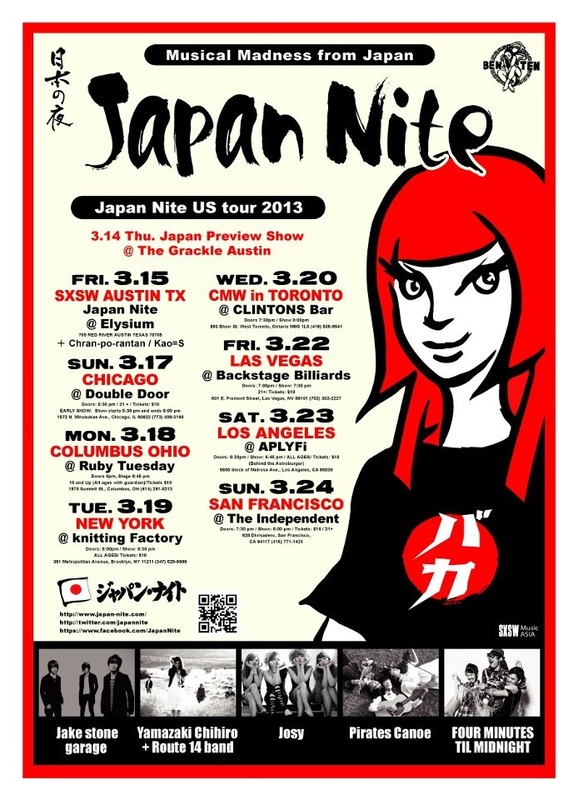 The Japan Nite Tour starts on Sunday in Chicago and hits six more cities including a first ever visit to Canada. The bands that will be traveling with the tour are Jake stone garage, Chihiro Yamazaki + Route 14 Band, Pirates Canoe, FOUR MINUTES TIL MIDNIGHT and JOSY. Visit Japan Nite’s website for more information!